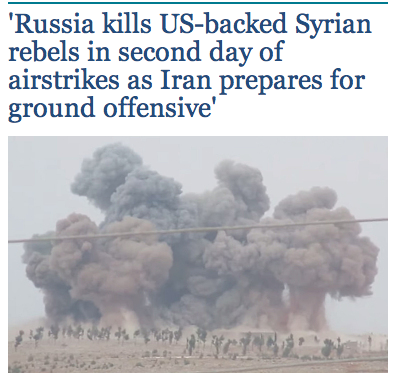 ‘Russia kills US-backed Syrian rebels in second day of airstrikes as Iran prepares for ground offensive’ and pray tell, who are ‘our rebels’ anyways? Recently, a troop of these ‘rebels’ turned all their weapons over to ISIS for example. Does anyone have the right to violently overthrow the government of Syria? How about Saudi Arabia run by depraved ‘royals’ installed by the British during WWI? I can’t imagine a nastier government system than that! Syria, on the other hand, is closer to Europe than Saudi Arabia, it being a socialist government. Pope Francis assures atheists: You don’t have to believe in God to go to heaven: it is official now. The Pope isn’t the Pope. First, they had a Nazi Pope who resigned for this guy. The Devil is having a blast at the Vatican. Heaven is a human concept created to make us less afraid of the Outer Darkness, aka, Death. Our ‘souls’ are shared by all living things and it is an odd thing indeed since it is simultaneously nothing and everything and is not attached to any bizarre personal belief systems of humans who use the gods as an excuse to be really, really nasty to each other and all other living things. BREAKING NEWS: Iraq Signs Collaboration Deal With Russia, Iran, Syria on ISIS Fight. ISIS was created by NATO. This is hilarious news, actually. MORE BREAKING NEWS: Donald Trump is free to cherry-pick his polls. But his decline is clear. He is only up 2% after nonstop media attacks. His rivals are up more than he but then, the polls ask everyone not party members. Trump: Rivals Want to Start World War 3 Over Syria. Amazing man. Yes, they are all talking about WWIII aka, the Apocalypse. The entire reason for the invasion of Iraq were deliberate lies by Bush, Cheney and the Zionist media about 9/11 when, with full cooperation from the CIA and Pentagon, four civilian jets were not only hijacked by ‘terrorists’ trained in the US right next to Jupiter Island, Florida which is where more CIA agents retire than anywhere on earth and the Bush clan has lots of homes for fun and games…these terrorists were mostly from Saudi Arabia and were supposedly working with bin Laden whose dad is very affiliated with the CIA. House Speaker John Boehner is resigning from Congress: news just in. Boehner, after weeping when Congress, for the first time in history, decided to have a foreign Pope lecture everyone about morals and weather conditions, suddenly resigned. He is retiring from Congress! This is shocking news. The GOP was taken over by religious fanatics who want to turn back the clock as does the Pope. Women’s right to choose whether she as children is at the center of this business. The GOP religious fanatics are joining the Muslims in demanding women have zero control over their own bodies. I was one of the first people to notice that the kid who made the ‘protobomb’ briefcase was doing exactly that: making something that could be turned into a bomb. Now more and more people, after seeing the picture of the briefcase made out to look identical to dozens of briefcase bombs that one can find via Google Images, things are heating up. After all the gifts, honors and goodies showered on this kid from Egypt, more and more people are noticing that he isn’t all that innocent at all, his ‘project’ involved nearly no real work unlike say, what I made for science fair when I was young. It was definitely a simple rig for making a briefcase bomb. 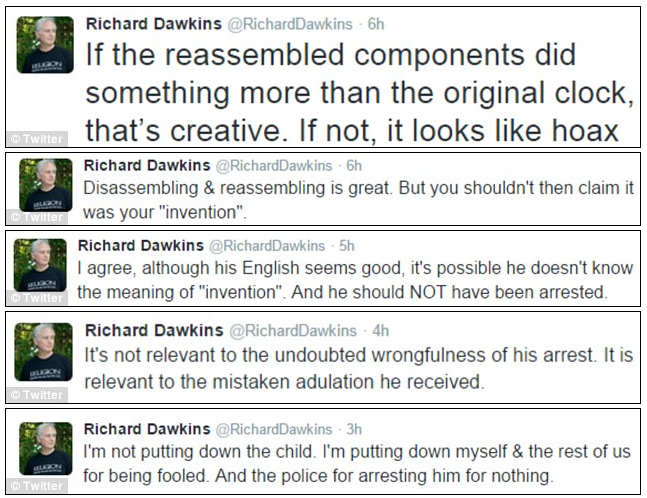 Now, the famous scientist, Richard Dawkins tells the same truth I said day one: Richard Dawkins lays in to Texas schoolboy Ahmed Mohamed on Twitter: this is a ‘fraud’.